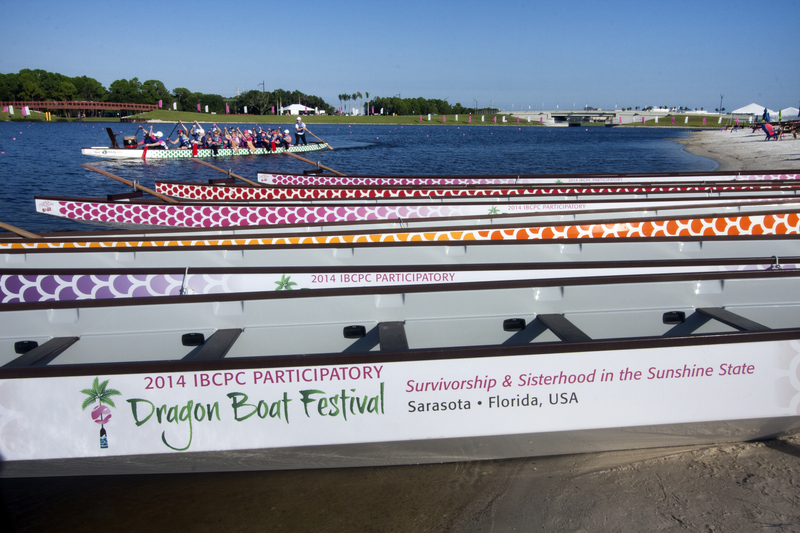 How Much Does a Dragon Boat Cost? One I get a lot. And one I struggle with because the answer is the familiar groan… “it depends”. I know customers hate it when I give them that answer but, hey, I’m just the messenger. I suppose the easiest way to describe the dynamic of purchasing a dragon boat is that it’s much like purchasing a car. You can go new or used; compact or full size; domestic or foreign; high end established brand… or new kid on the block. There are a number of manufacturer makes & models with choices of colors, options & accessories. Some come fully loaded and others you simply start with a base model for “x” price and build it up from there. 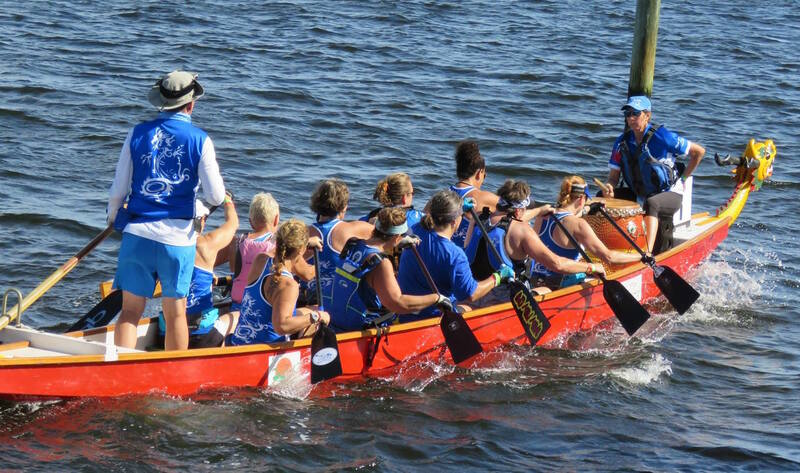 In this article I will do my best to describe the various dragon boats that are available to the North American consumer in the hopes that it will assist you with making an informed decision on which make-model is the best fit for your club or festival. The information contained herein is very basic. If you have specific questions about any product you should contact the dealer in your country. I’m going to get started by listing each manufacturer, the location of the manufacturing facility, technical comments, prices and sources based on my latest research. But first I would like to provide you with a description of the types of dragon boats that most manufacturers are building these days. By this I mean the international standard boat specifications that are being distributed in North America.
. IDBF – stands for International Dragon Boat Federation. The IDBF is the official world governing body for our sport and sets standards and specifications for dragon boats (and paddles).
. ISRDB – stands for International Standard Racing Dragon Boat.
. gelcoat – is the outside layer of paint on a dragon boat. It’s not really a paint but a much harder, scratch/impact resistant, waterproof application that is first sprayed into a mold when building a boat.
. lamination schedule – refers to the layers & types of fiberglass and core material used in combination with gelcoat and polyester resin to construct the boat’s outer hull and its interior liner (if applicable).
. 2-part construction – this method of building a dragon boat is now used by all but one manufacturer. It involves molding an exterior hull and a matching interior liner separately and then laminating (gluing) the liner into the hull. This method requires an initial investment in tooling (making the molds) but reduces labor cost since the interior finish is achieved in a mold and is very nice and shiny indeed!
. 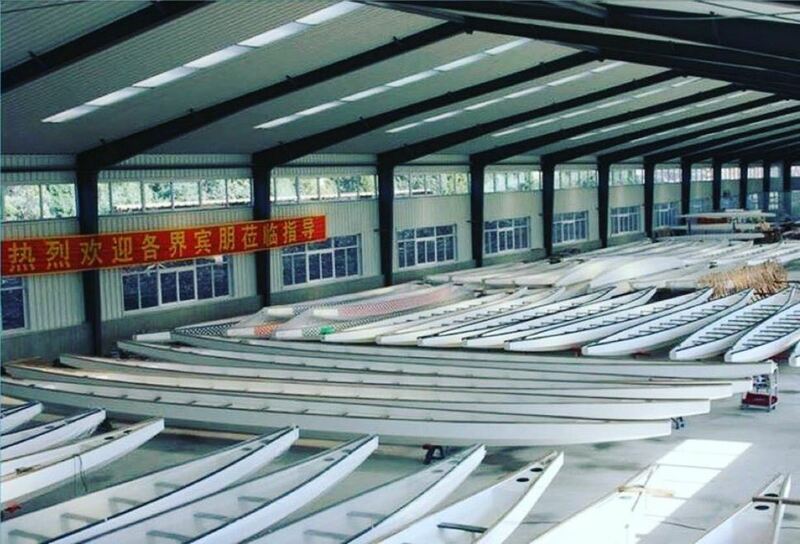 Chine Plank Angle – when viewing a continuous cross-section of a dragon boat, this is the angle of the longitudinal plane of the boat that attaches the vertical topside to the horizontal keel (the Chine), to the water. See a sketch of what a chine plank angle is here. It started in Europe in the late 1990’s, first with a UK manufacturer, then along came a Dutch fellow and the German company, Boots und Kunststoffbau, commonly referred to here in North America as BuK. Since the BuK boat was the first fiberglass dragon boat, and the only2 Euro dragon boat currently being imported into North America, I’m going to start with them. I’m not going to discuss very early models prior to 2010 for any of these manufacturers. Instead I will write only about the bulk of what is available for sale in the North American market today. I will only review boats manufactured by IDBF licensed builders; those being: BuK, Champion, Swift and Kahlua. All the builders mentioned above manufacture the various models of the ISRDB. Although they are confined to mold their boats to conform to the ISRDB specification, the data in the specification provides +/- tolerances which has led to subtle differences in the exterior and interior features of the hull built by each factory. These differences can affect the way their boat behaves on the water. More on this later. The 1222, 20-paddler fiberglass boat has been the staple of domestic and international racing since the IDBF World Championships took place in Nottingham, England in 1999. Back then, the Euro version of the 1222 model boat had 12 benches, which I thought was very strange, but by 2001 the 10-bench version BuK was widely available in North America. Honestly, I’m not really sure when the ‘912’ 10-paddler boats came to be. Maybe because I was never a fan. I preferred the big boats and the spectacle they displayed at festivals. That 10-paddler boat just didn’t do it for me. Not to mention I was in the business of getting lots of butts in boats and if that darn 10-paddler boat ever took over it was going to literally trim my business in half; So I thought. The most recent addition to the IDBF ISRDB family is the 912 HP boat. The HP boat is the IDBF’s attempt to become optically “Olympic”. The design was cast to be sleek and fast. Of course, this meant the design would appeal primarily to the very elite in the sport since stability is definitely not its best feature. OK, here we go. I will tell a story about each boat but not go into too much detail about design or performance features in this article. For additional details, next month I will be following up this article with a separate review of each boat and will summarize my views in a comparison table. To prospective boat owners who have questions… always feel free to contact me and I will try to answer any questions for you that I have not addressed in this article. Ahhh, the BuK. Full disclosure. I was the guy in Nottingham in 1999 who picked the BuK to import to Canada for distribution across the continent. My German heritage pulled me that way, I think. Funnily, the BuK brothers initially rejected my offer because they didn’t like the idea I presented… which was to just buy the fiberglass shell rather than the completed boat. I told them I needed to re-configure the interior to accommodate 10 benches rather than the 12 benches built into their current Euro model. But in the final hour of the Nations Cup celebration party on Sunday evening they plopped down a bottle of wine at my table and we hashed out a deal. Fast forward to present day. The BuK is, in my view, still the premier boat on the market today, but not by as much of a margin as in the past. Back to the “buying a car” analogy, the German’s are innovative in design, focused on performance and obsessed with quality control. Of the 4 builders being reviewed here, BuK is the only ISO 9001 manufacturer. Of course, all this praise comes at a price. The BuK is the most expensive boat of the bunch. However, this does not mean that, over the lifetime of the boat, a BuK will cost you more. It may be the case that it will cost you less. I still distribute the BuK here in the United States, but recent sales of new boats are far and few between due to a number of factors. Firstly, design innovations and quality of construction of the Chinese built boats have gradually approached the level of BuK. Not there yet… but getting awfully close. Second, with the proper approach, you can acquire a very good quality Champion or Swift boat at half the cost of a BuK. That said, word on the street is that BuK recently licensed their brand to a Chinese factory, although it is unclear at this time whether the Chinese built BuK will be available in North America. Even then, it may not be priced much differently than its Euro sibling. The story of this manufacturer is typical of any China boat manufacturer who ventured into the North American space in the early years of this century. The design and quality has improved steadily with every new model launch. By 2017, Champion had improved its design and quality (and market penetration) to the point that its sales have outpaced BuK in both Canada and the USA. To say that Champion has been aggressive in its approach to North American sales & pricing is an understatement. The U.S. west coast is saturated with their products and they recently scooped the boat supply contract for the 2018 ICF world championship event taking place in Atlanta. While it’s too early to tell how the boat will wear over time I have to say that, off the shelf, it is a very good product with some trending design features. If you are in the market for a discounted boat and not in a rush, you should be able to snag one for a great price after the Atlanta event next fall. In fact, Mission typically has used boats on hand so feel free to negotiate with them. The one distinguishing comment I would make about all Champion boats made to this date is that they are tippy. This is not to say that the boat is not a good fit for your club. Some clubs see the tippy-ness as an excellent training tool. On one hand, if they attend an event that uses Champion boats they would be much more attuned to the feel of the race fleet while other crews might initially feel uncomfortable if they had not experienced this weeble-wobble boat before. On the other hand, if they attend a competition that uses one of the more stable versions of the ISRDB then their comfort level and balance would be enhanced. If your club trains in potentially rough water or shares a waterway with powered pleasure boats, this may not be the boat for you. That said, my sources tell me that Champion, after many years of hearing about boat swamps and tip-overs here in North America, has plans to re-tool its molds to adjust their chine plank angle downward in order to stabilize the hull. You’ll hear from me if this happens. Swift boats may be the most recent entry into the North American market but by no means is this a new builder. Swift boats have been sold in China by the thousands long before Champion and BuK came to be. Swift is also a huge maker of rowing shells, sprint canoes, kayaks, surf skis… you get the picture. Consequently, they understand composites and are active in fabricating high-quality marine laminates across all watersport spectrums. I recently had the opportunity to deliver two of the Swift 10-paddler boats to a couple of clubs in Florida. Like the Champion, the quality is very good, and it has some unique features which make it stand out ahead of other boats in this review. For example, the scale graphic is sublimated right into the gel coat (no stickers). This is a difficult and time-consuming process so kudos to Swift for adding this feature. I also like the substantial support that the interior liner design provides for each paddler bench. The support also doubles as a chine plank foot brace. The footboards themselves are spaced more generously. From a quality-fit-finish perspective I would rate Swift and Champion about the same. Stability has been reported to me by several coaches and the consensus is that it sits somewhere between a Champion and a BuK. You’ll notice that Swift builds two grades of boats; premium and club. The premium model’s hull and liner are laid up with a micro-balloon core material which provides greater strength with less weight. This is a similar lay-up used in the BuK factory. I’ll be talking about how a boat delivery affects your purchase price in a follow-up article but will quickly mention a key benefit related to the Swift boat that may keep your acquisition cost down. Since Swift regularly ships containers of rowing shells to all corners of the country, they have the option to load one or two dragon boats into these containers. This means that, when you order a Swift boat, it is likely to be available to pick up at a North American port of entry that is close to your club. Now, I wonder if you caught the one accessory that I listed above that Swift now includes with the all their boats that none of the other builders do. The cover. This is HUGE! 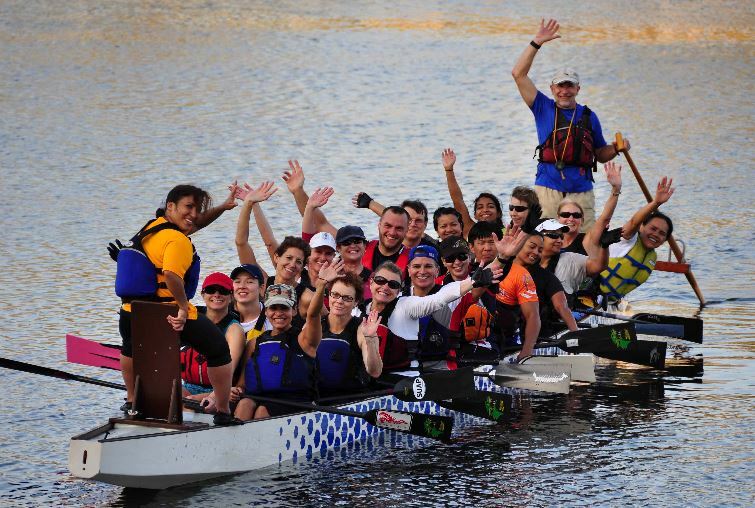 Dragon boat covers are pricey and almost every club wants one. They just can’t afford one. A cover keeps your boat clean, maintains its value, does away with bailing, bird poop, and lets you store the boat right side up if you experience snowy winters. I’ve not seen their cover yet but if they do a good job and deliver each boat with its own custom cover then this gives the Swift boat package an edge over its competitors. Of course, other manufacturers may (and should) follow Swift’s lead in order to remain competitive, and that will be good for everyone. Disclosure: I own these molds but do not currently market/sell the ISRDB version. This is the only boat being reviewed here that is built in North America; previously in Toronto and more recently in Tampa, Florida. Like the BuK, the Kahlua ISRDB hull shape provides for a very stable ride. I’ve steered both BuK’s and Kahlua’s extensively and the feel I get from the back is essentially the same. The key feature that distinguishes the Kahlua boat from the other three is that it does not glue in an interior liner. Instead, the Kahlua uses a solid fiberglass layup with a 2mm core material between fiberglass layers to achieve a high degree of rigidity. In fact, the combination of this aggressive lamination schedule, substantial bulkheads and 15mm thick, marine plywood inwales make this the stiffest boat of the bunch. Does stiffness matter? I suppose it would if the other boats did not achieve a sufficient degree of hull rigidity using the 2-part liner method. They do. That said, the Kahlua is bulletproof. By that I mean the hull is more impervious to penetration than liner based hulls. In case of an encounter with a submerged rock or stump a Kahlua would fair better and would be easier to repair. If you like nice glossy mahogany and teak finishes in your dragon boat, then the Kahlua is worth a look. But be prepared to take care of these wood surfaces or your new Kahlua will lose its shine in a couple of years. Beyond this, there is nothing remarkable about the Kahlua brand. I love tropical wood finishes and I admire the craftsmanship that is required to put this boat together. It is worth noting that the other two Kahlua boats available in North America do not have an IDBF license. The 10-paddler boat is actually a hybrid version that is a bit sleeker and faster than the IDBF 10-paddler club boat but not nearly as narrow as the IDBF 10-paddler HP racing boat. The result is a 10-paddler boat that is still comfortably stable and safe to paddle for novice teams. The 24-paddler Kahlua boat is 44 feet long and 48” wide. If your club frequently sits 1 to 4 paddlers on the dock during practices, then this 12 bench Kahlua solves that problem. It is also an extremely stable hull and can withstand chop and wakes that would typically swamp and/or flip an ISRDB. You won’t be picking this boat up and walking around with it though. It’s a tank at over 1200 lbs! 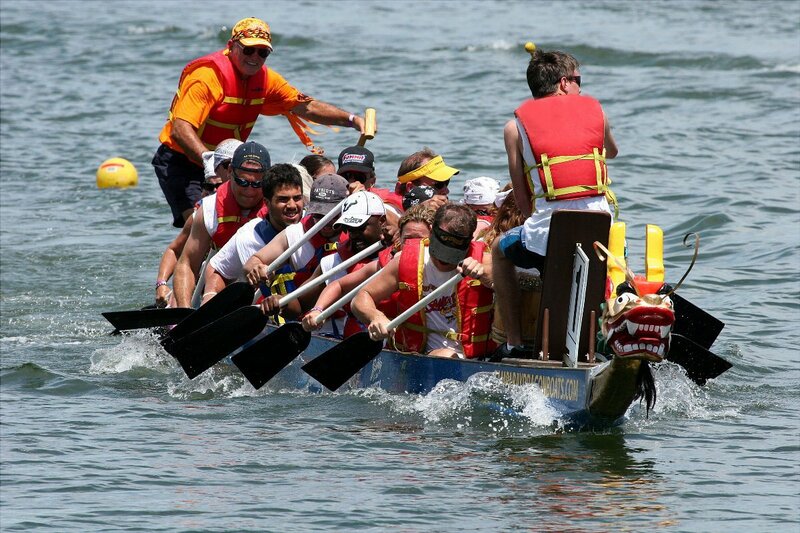 Wouldn’t be great if a dragon boat could fit inside a USPS flat-rate box or FedEx Pak? Alas, this will never be. You may have negotiated an amazing price for your new boat but you’re in Seattle and the boat is 3000 miles away in Tampa or Montreal. The transport cost just blew your budget. I’m not going to pretend I have a solution. The first thing to do is simply ask the seller for delivery to be included in the purchase price. Nice try! You can usually count on at least $1 per mile to have your boat delivered. That said, there are options. If you have a trailer, or can borrow one, you can come and get the boat yourself. If you don’t have access to a trailer you should consider buying one from the company that sold you the boat and coming to pick up both. The savings on third party delivery could pay for a substantial portion of a new trailer. Of course, you’d need to own or borrow a decent sized SUV at the very least. If you don’t have a properly equipped truck you could rent a Uhaul at the pick-up location and hook up your new trailer to that. In certain circumstances, if you have purchased your boat from an affiliated event production company like 22D, GWN or Pan Am you can ask if the boat can be delivered to you or at least in your general direction on one of their festival rental loads. You’d need to be flexible and still pay something per mile albeit less than an exclusive haul. This opportunity is rare since most production trailer loads are at capacity. I mentioned earlier that Swift is in a unique position to deliver single boats to many entry points across the country. This fact alone could sway your buying decision in their direction if the transport cost saving is substantial. There is so much more to tell you about the boats above. This article is already too long. I will be doing some additional research, travelling to factories and speaking with manufacturers and dealers about product updates. I will write more about each one of these boats in separate articles in the coming months. I also hope to post some video reviews in 2018. Stay tuned. I sincerely hope this helps you with the purchase of the dragon boat that is the best fit for your club or festival.